I thought I’d share a spring bloom even though it will be a long time before we see any around here. We are experiencing serious winter weather right now; we’ve got plenty of snow, plenty of ice and plenty of cold! I’m sure I will be creating more wintry scenes in the weeks ahead because although cold outside, it is also beautiful. 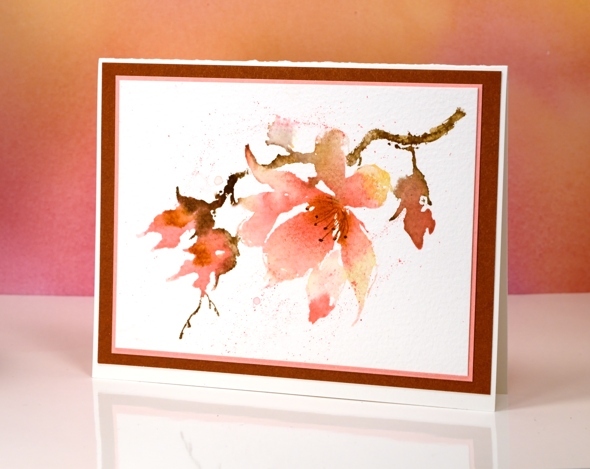 To create this watercoloured magnolia I inked the ‘unfolding’ stamp with memento markers, spritzed the stamp and stamped on cold pressed watercolour paper. I used a brush to blend colour within the petals and stems and to splatter some ink over the stamped image. Creating such a loose print meant that the sepals on the stamp were lost so I drew them on after the stamping dried. Do you use the markers, dew drop pads or regular size pads? On this card I used markers but I often use the regular size ink pads too. Just breathtaking Heather, your use of colour is just wonderful! What a beautiful watercoloured magnolia, Heather. Really gorgeous! Beautiful! Such perfect soft colours. Oh this is so pretty – thanks so much for sharing your work! Plenty of snow and cold here in NH too so this is delightful! Thanks Maureen, hope you’re staying warm! a beauty to enjoy on this stinkin cold day 😉 Thanks Heather…you do great work. Beautiful stamp. Awesome card Heather! Thanks Cathy for your kind words, I don’t mind the cold so much as long as I get a nice hot summer to balance things out! WOWZA! I am bowled over! This is gorgeous! Thanks for sharing and happy New Year to you and your family! Gorgeous card! I love the color combination you used. You inspire me! Love the colouring of the Magnolia ❤.